I know! 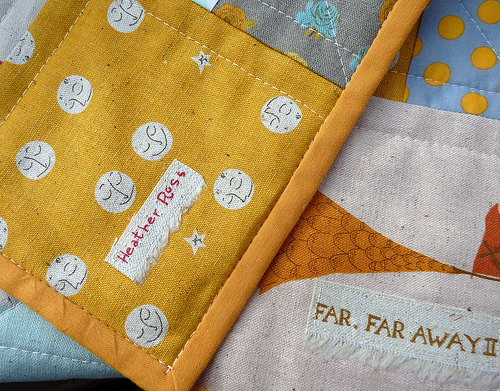 There weren't exactly any progress reports for the Far Far Away 2 Quilt, it just kind of happened, from Sunday Stash to a finished quilt on Thursday. Admittedly there was a fair amount of time spent working on this quilt during this period. This quilt was largely unplanned. I knew I wanted to fussy cut the larger prints from the fabric range, and then piece four-patch blocks from the smaller scale prints to alternate. The layout/quilt size was then very much limited to quantity of fabric from the Far Far Away 2 on hand - a fat quarter of each. 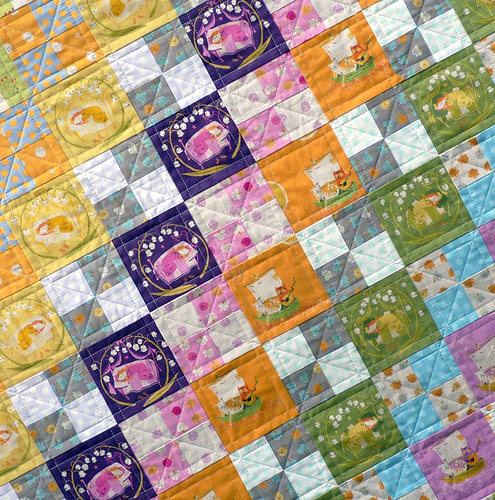 As each of the fat quarters were cut at a different interval of the fabric repeat, not all of the prints resulted in the same number of fussy cut blocks. As it so happened I was able to fussy cut the most blocks from purple Sleeping Beauty print. The linen blend fabrics are a heavier weight than the standard quilting cotton, however they are definitely much easier to use than the double gauze from the first Far Far Away range. I did not encounter any difficulties piecing a quilt from these fabrics, and remembered to use a heavier-duty sewing needle ( 90/14). The back of the quilt features some of the left-over pieces of FFA2 fabrics, and I have used a Kaufman Kona Cotton Solid for the rest of the quilt back to try to balance out the extra weight of the quilt due to the heavier linen blend fabrics. The quilting ensures that the fussy cut prints continue to be featured, with diagonal lines running only through the small scale prints. I also thought it appropriate to crank up the stitch length on these linen fabrics, and turn them into another feature rather than just a straight line. From last week's delicate and lightweight voile fabrics to this week's linen blend prints I have certainly enjoyed the challenge of piecing and quilting with such very different textures and fabric weights. I also thought it would be fun to add a piece of the selvage to the bottom left and right hand corners of the quilt as a tribute to the designer and a reminder of the name of the fabric range. A cute little detail. Really nice! 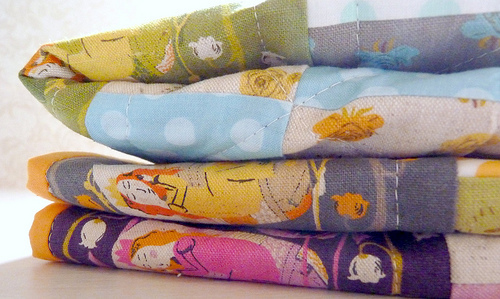 I love these fabrics and what you did with them. Truly amazing!!!!! It's beautiful, I love it. The best part about your quilts are the quilting itself. I'm amazed you do this on a conventional machine. You really do a fabulous job. I have no idea how you are so patient!!! The extra work of fussy cutting was worth it, and I love the diagonal lines on the patch pieces. It's a great accent! 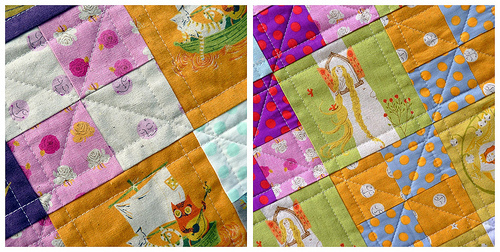 You just pump out these quilts non-stop - it's amazing! I'm still working on my first quilt after months! I said it before, but this is definitely my favorite of the FFA2 I've seen! Fabulous Rita!! Did you use your standard batting with this FFA2. I'm about to cut into mine. Ooh, I love the little selvedge labels. What a fun way to honor the fabric! That quilting pattern is so pretty, it makes me wish I was quilting my Fairytale Patchwork quilt, instead of the current hand-quilting plan. Aaaah... I want to quilt something! Amazingly beautiful quilt. Every time I come to your blog I just sigghhhh. Really beautiful work. 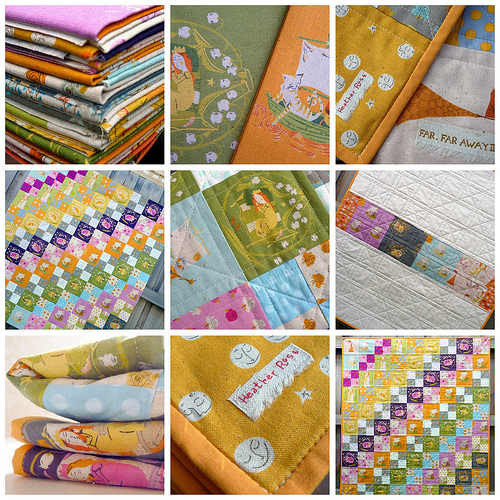 You never cease to amaze - from the fab combos, to the quilting, to the binding, wow! It's perfect. I think I need to buy some of that! Great job. Such a cute quilt. And being selvage-obsessed like I am, the selvages were absolutely the perfect touch! Just fabulous! It will be a treasure to the little princess that receives it, I'm sure. That's a very clever way to quilt this design. Great job, once again, Rita ! Wow Rita! This quilt is lovely. It makes me want some Far Far Away for my stash. I love the fussy cutting and the little bits of selvage you put on there. I'm still working on getting my first quilt pieced together and I started back in January. You amaze me with your ability to do all this in one week! Love the fussy cutting on this one Rita. Clearly someone has recognised its beauty already and snapped it up. I'm not surprised it's sold already, it's really gorgeous. Well done! Well done Rita! love it. This quilt just turned out beautifully, Rita! Stunning. Wow Rita, just gorgeous!! Whoa- gone already! I love the idea of the selvage edges- great idea! Rita this is absolutely Marvelous!!! It's no wonder it sold lickety split. I can't wait to search around now and see more Far Far Away 2 quilts. All details you carefully add to your quilt are so special. I REALLY love this one. I love it! You do awesome work, I have been sewing for a long time but not long for quilts. My first quilt stippling was terrible. You have been a inspiration for me and thought I would let you know. My mom used to sing us a song called "Far, Far Away" when I was a little girl. Do you know that song? *mama,sing us the faraway song* we all would chime at bedtime. 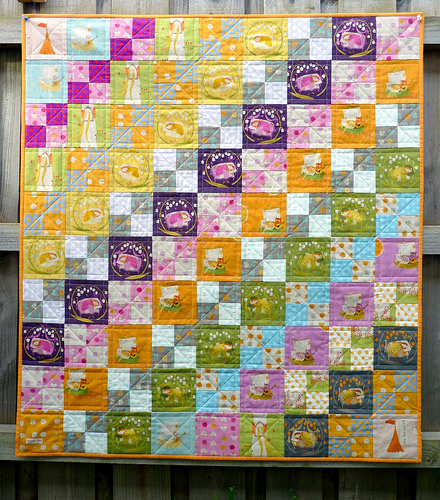 "Around her head, she wore a yellow ribbon...."
A great quilt idea to combine the fussy cut squares with the 4 patch ones. And the quilting is a perfect idea. No wonder the quilt sold so quickly! Super, as always. 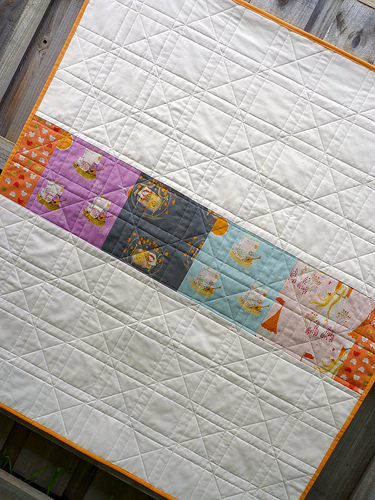 Love this, especially how your quilting highlights your fabrics, just as you planned! Love it!! It look fantastic! Im in the process of finishing my heather ross...cant wait! This is so gorgeous it made me want to cry. MUST order even more more more of the FFA-fabrics than I'm already planning to. I've seen similar quilts before: a diagonal rainbow of blocks and 4patches... but this is exquisite. It's exactly what I didn't know I wanted done with far far away. Even the quilting. Oh my word that is beautiful! I love it!